Intergoom carries the excitement of a Paris runway show. It has the calling card of being the largest international pet grooming show. And it lives up to its billing. Each year we all revel in the amazing growth in pet grooming. Groomers are both artists and therapists, helping their pet customers look beautiful and have fun getting that way. One of the underappreciated talents of groomers is how they keep their pets loving the experience. 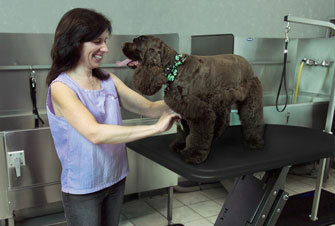 Shor-Line developed the Elite Grooming Table with input from pet groomers. The Stainless Steel Grooming Arm is 12-gauge stainless steel and includes five locking positions. It pivots 180 degrees, allowing the groomer to dance around the pet as needed. The GROOMER decides where to be, not being limited by the arm! Safety and durability are important to Shor-Line, so we are the only company to take the added measure of CSA/UL certification. We have worked with groomers for decades so we understand just what a toll grooming takes on your body. That is why we build in lots of ergonomic choices so you and your staff choose what is best. 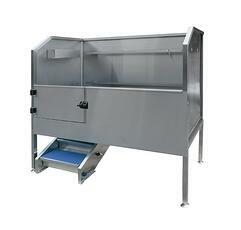 Our innovative STeprAMP system lets you choose steps or a ramp to get the pet into the tub. This helps arthritic dogs move with better footing, gives the pet some choices and saves your back. Some of the trends in reducing stress for pets during veterinary treatment recommend this type of approach in which the pet and the handler have options. We will be showing our latest grooming equipment at the show. 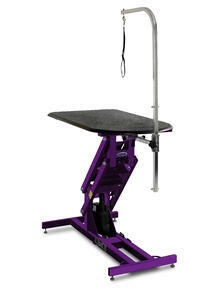 We believe your equipment is an investment that should last you for decades, so come feel the durability! If you can't make the show, we don't want to leave you out. We are extending the show discount on grooming products until June 30, 2015. 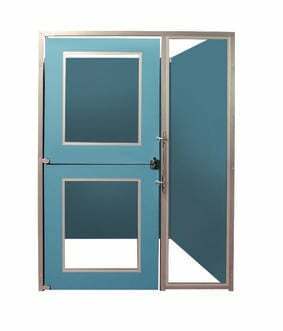 Check out our products and contact a salesperson. Tell them you want the Intergroom price. Remember! We are extending the Intergroom show attendee discount to ALL grooming products. Having trouble with rattling blades? We recruited an industry professional, The Sharper Edge of KC, to highlight some methods of preventing rattling blades. When preparing patients for surgery or minor procedures, hair is shaved close to the skin with #40 and #50 blades. For groomers spring shave downs to remove the undercoat will bring out all sizes of blades. Whichever ones you are using sometimes the blades will rattle when starting up the clipper. That rattling can cause the blade not to perform properly and stress the animal. One simple remedy for rattling blades can be solved in the clinic or grooming shop. Sometimes when the blades are taken off the hinge the socket ears are stretched or separated too much. Pinching the socket ears on the blade will help. You can over pinch them and need to replace the socket so take care not to overdue pinching them. The Sharper Edge of KC (Kansas City) uses a machine guide block to return the socket ears to the correct position. "When we reassemble our blades after sharpening, we test each one to make sure the problem is corrected. If the problem still exists after pinching the socket, then the next step might be a new socket or hinge. Hinge screws can come loose or hinge springs can lose tension which results in rattle." Want to know more? Visit thesharperedgeofkc.com for all the latest news and tips related to the grooming industry.